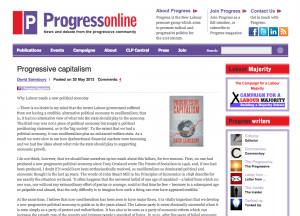 There is no doubt in my mind that the recent Labour government suffered from not having a credible, alternative political economy to neoliberalism; that is, it had no alternative view of what role the state should play in the economy. The third way was not a piece of political economy but simply a political positioning statement, as is the ‘big society’. To the extent that we had a political economy, it was neoliberalism plus an enhanced welfare state. As a result we were slow to see how dysfunctional financial markets were becoming and we had few ideas about what role the state should play in supporting economic growth.